You can follow along here. We plan on interviewing every event winner this weekend, so please if you strike gold at the Meet of Champions give NJ MileSplit a visit at the media table. Hopewell Valley wins out of the fast heat with a time of 7.57.34 and defends their title, meet record for the event that is only in its second year at the indoor Meet of Champions. North Hunterdon boys made their best effort out of the first heat for second at 7.59.05. 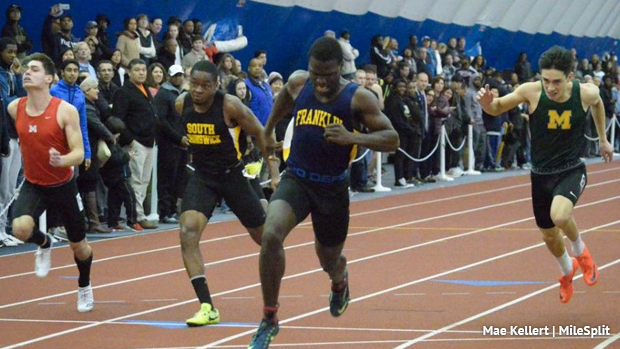 Mario Heslop rips a 48.71 to win the 400m, the Franklin Twp junior now has the NJ#1 spot this season. Nadale Buntin of JP Stevens second at 48.98. Drew Maher of Shore Regional continues his dominating state season with a run of 4:11.83 for the 1600m Meet of Champions title, the first in his school's history. Just off the meet record of 4:11.66 held by Ben Malone since 2012. Second was Voorhees senior Chris Romero at 4:14.24. Luis Peralta of Passaic makes a brilliant last lap effort to overtake the leaders and run to his first Meet of Champions title with a time of 1:54.54 US#10. Only a junior he'll have a chance to defend next year. Atharv Kulkarni of WWPNorth second at 1:55.20 and Damien Dilcher of Brick third at 1:55.65. Mario Heslop wins the 200m with room to spare at 21.75, a venue record and meet record. Sincere Rhea of St Augustine toasts the field for a 7.35 victory. A big year for this junior who has dropped to 7.35 from his PR of 7.70 a year ago. Gabriel Nash of Elizabeth wins the 55 with a time of 6.42! Out runs the tripling Mario Heslop in second at 6.45. Thomas Hampton of Clayton 6.47. Devin Hart runs 9:06.11!!!! US#4 this season. That's two thirds of the way through a Meet of Champions triple crown, Hart also won the cross country Meet of Champions. Second was Colin Logsdon of Chatham 9:17.29. East Orange Campus defends their title with a 3:24.02 and that was without Akeem Lindo. Etienne, Richardson, Fobay, and Carney on that squad. Tyler Hrbek of Old Tappan wins the pole vault at 15-00 after a battle with multiple great athletes including Hunterdon Central's David Bausmith who also cleared the 15-00 bar. This is the second straight year Old Tappan takes home the pole vault title as teammate Seth Kricheff won it last year. A'Nan Bridgett of WWPSouth increases his season best height by four inches!! Clears 6-08 to win on jumps over Jadon Watson of JFK Paterson who also cleared 6-08. C.J. Licata of Gill St. Bernard's 62-07.75 to win the Meet of Champions title!